The other day Stephanie posted her Granny Stripe Blanket progress HERE. So far in our "Friends Helping Friends" project I think we're both making great progress! It's a very dark and dreary day here so I thought I would try to liven up the photos with some of my copper lustre collection. I don't think it helped much, but maybe makes the photos look a little more pretty. This is slightly closer. I crochet 10 rows of one color, then a row of a variegated yarn before I switch to the next color. 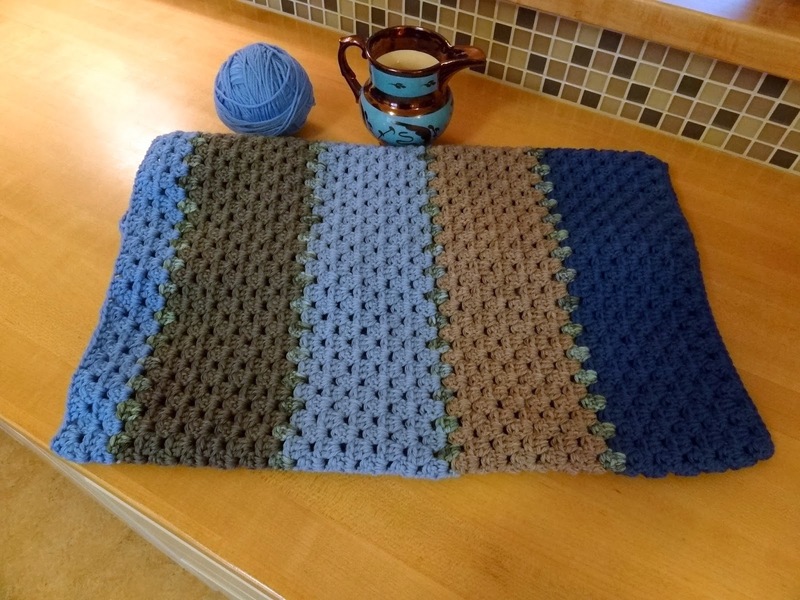 I am thinking of crocheting an edge all around when it's done in the same variegated yarn. It seems to go faster and faster as my arthritic hands begin to get used to the motions. Only a couple more color changes and I'll have a sweet little lap blanket! It's amazing what you can do with yarn you had and didn't like! Very nice! You have so many talents - I bet the kitties love yarn projects! I love the bit of variegated yarn separating the color changes. Love the props too. I still have a ways to go but I'm making good progress. Are the girls bored with their yarn ball yet? that will be nice when it's finished, I haven't done crochet in years, one day I'm going to revisit it & see if I remember how lol! It looks so pretty and I like the idea of the varigated stripe between the colors. So pretty!!! It will be so cozy when finished. I've always admired crocheted projects. I like those colors! And you can't go wrong with a granny stripe. I love to crochet in the car - while dh is driving of course, so I always have a project in progress. I love crocheting in the winter time. Keeps me warm while I'm working on it! I'd love to learn to crochet but I keep on talking myself out of it because the one thing I don't need is another hobby! I love your blanket Candace. I posted pics of mine today. I'm not sure I like my yarn choices but I've decided I can live with it. I sort of did the opposite in that I used varigated yarn for the larger stripe. It does work up fast! Glad you explained about the variegated yarn--thought my eyes were playing some kind of trick :) It does look so plush and warm. Sure to be fondly used when completed! Hope your weather warms up. I won't mention our weather. Ahem. That looks great, and the idea of using the variegated wool was very clever. Your Granny blanket is growing nicely. 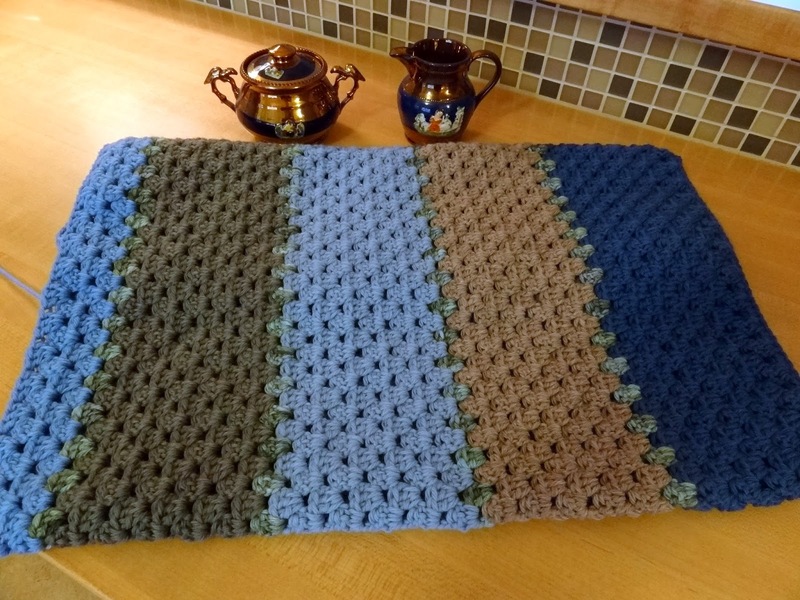 Crocheting is a great TV craft as you don't need to keep your eyes at the work all the time. Just let your hands go on autopilot! Very pretty. You will like it, I'm sure. Yes, hasn't it been dreary? We got a good look at the wheat today. some of it is okay, believe it or not (wheat needs a winter coat of snow to survive sub-freezing weather and it didn't get that this past little while - for those of you new to this topic of wheat). Some of it was just plain yellow, which isn't good. So, the farmers won't know for a while what's up. Meanwhile, we're snug in our rugs (blankets, English-style)and beginning to feel that spring would be nice. What do you think? You'll have your afghan, I'll have my log cabin lap quilt. We'll be fine. It looks gorgeous, Candace! love the warmth of the colors, I can already tell it is going to be a go-to snuggly blanket on cold days. Very nice! Have you tried the ergonomic crochet hooks from Addi? I know they have really helped my mom, to ease the arthritis pain during / after crocheting. Your blanket is beautiful! I really love the variegated yarn between each color change. Makes me want to get out my crochet hook!